Caslys ushtey-ghaa as pensyl jeh Jane Austen. T'ad credjal dy row eh tayrnit ec e shuyr Cassandra mysh 1810. By noaskeealagh ee Jane Austen (16 Mee ny Nollick, 1775 - 28 Mean Souree, 1817). T'ee mie er enney er son obbraghyn myr Pride and Prejudice as Sense and Sensibility. Screeu ee ayns aght rieaughagh as gamlagh, as v'ee coontit myr fakider sheshaght tastagh. 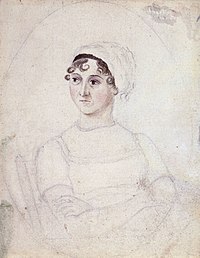 ↑ Kirkham, "Portraits", Jane Austen in Context, 69–72.